THE HUSBAND of a young mum-of-two found dead at her home has been charged with her murder. 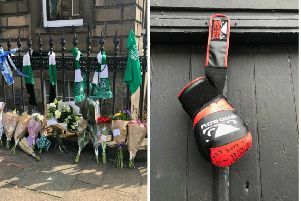 Erhan Havaleoglu, 35, was arrested after the body of Leighanne Cameron was discovered at an address in Calder House Road, in Mid Calder, West Lothian on Wednesday. Havaleoglu appeared on petition at Livingston Sheriff Court accused of murder. He made no plea or declaration and was remanded in custody pending further inquiries. Ms Cameron, 29, was rushed to hospital from the property, but could not be saved. Detective Inspector Phil Richards said: “We are still looking trace witnesses in connection with this incident and are appealing for anyone with information to come forward. Tributes to the city council care worker were led by her family, who issued a poignant statement via police. “Leighanne was a much-loved daughter, sister and mother of two young children whom she adored, and who absolutely adored her,” they said. The quiet cul-de-sac was completely cordoned off throughout yesterday, with residents having to sign in and out with police. A forensic tent was in place outside the front door of the family home, guarded by a single officer, while CID officers conducted door-to-door inquiries. At the back of the house, children’s toys could be seen scattered in the garden while washing was on the line. Former Balerno High pupil Ms Cameron, who was originally from Kirknewton, had a young son and daughter. Former colleague Samantha Innes was among the friends to post condolence messages on social media. Audrey Hughes said she was “stunned” to hear about Ms Cameron’s death, describing her as a “brilliant carer”.